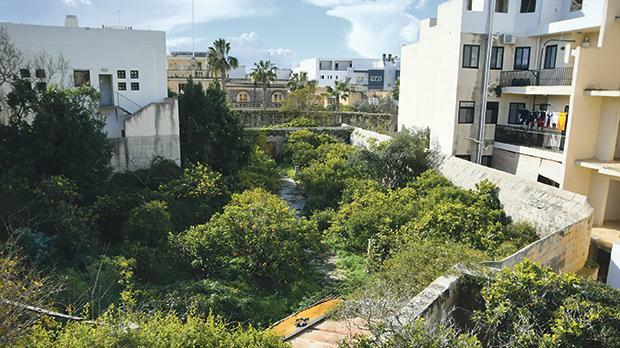 The Superintendence of Cultural Heritage is calling for the protection of a garden that once formed part of the servants’ quarters of a scheduled 18th century palazzo in Żejtun. Developers are seeking to build 20 residential units and underlying garages in a part of the garden, which is not all covered by the protection afforded to the palazzo, Villa Curmi, and its own grounds. The Planning Authority’s case officer is recommending refusal, echoing calls by the Superintendence for the garden to be protected in its entirety as it contains features such as walls of historical and architectural significance. The building was constructed in the 18th century by Paolo Curmi, who went on to become mayor of Żejtun in the 1800s. Its gardens are divided into three parts. An internal courtyard with an ornate gateway and steps leads to the largest part. This has a central passageway leading to a belvedere that overlooks the garden. The third part, which was reserved for the servants, is accessible through the main garden or through the servants’ quarters which lie next door to the massive palazzo. In 2006, the Planning Authority scheduled Villa Curmi and the servants’ quarters as a Grade 2 building of architectural and historical importance. The application proposes to develop part of the historic garden, constructing 12 basement garages for two dozen cars, four maisonettes at ground floor level, and 16 apartments on four floors. In September, the Planning Authority’s Cultural Heritage Advisory Committee met to discuss a request to de-schedule that part of the site included in the development application. However, the committee concluded that the garden forms an integral part of Villa Curmi, the scheduled property, and the scheduling should remain as is. The Superintendence of Cultural Heritage objected to the proposed encroachment onto scheduled property, saying it had already sustained a number of extensive encroachments and any further intrusions could not be tolerated. Wirt iż-Żejtun has also objected to the proposed project, saying the garden had been eaten away bit by bit over the last 60 years. It is also insisting that changes be made to cultural heritage legislation so that such properties are protected in their entirety. In the 1950s, when 25th November Avenue in Żejtun was built, it passed through the edge of the garden. In the 1990s, part of the garden was sold to a local bank which built a branch there. From that point, the owners have been selling off the land piece by piece “without respect to the historical and architectural value of this home and its garden”, according to the NGO. Nadia Cassar and her husband, who own the palazzo but not the servants’ quarters, are objecting to the plans. They told The Sunday Times of Malta when contacted that they did not want “any more mutilations of this house. It’s a gem – we need to safeguard the little we have for the next generations”. She explained that the property and its gardens had been inherited by the Curmi family. While some retained the property, others sold off their shares to developers. One area, she added, had become a “slum” and was occupied by squatters. Dr Cassar said the scheduled palazzo where she lives with her family includes rooms with frescoes and others with vaulted ceilings. The family is in the process of restoring the property, including the frescoes, for which they obtained funding through the Irrestawra Darek initiative for scheduled buildings.